After each meal, we have to hold Wylla upright for ten to fifteen minutes to help the food travel from her esophagus to stomach. Somedays it's easy, somedays it's a struggle to get her to hold still and remain in that position. On occasion she'll doze off which allows us to hold her a wee bit longer, which is always a good thing. The other day she took a good nap in my hands. She woke for a moment, stretched, crossed her arms, and instead of tucking them back in, her arms stayed up. Thankfully, Craig and camera were close to capture her cuteness. Oh, for heaven's sake. Just when I think she can't make me squee any louder. AWWW! What a trooper! I'm sure that holding her like that is getting a bit boring for her, and she'd rather be doing other things. No matter, Miss Wylla can't do anything without pouring on the cuteness! Laurie, this is the greatest set of photos. Wylla is such a sweetie. You all are real troopers!! bless her heart! how is that comfortable? Oh my goodness, pink paw pads, stretchy arms, sleepy face... kerthunk!Knocked over by the cute. Oh what a sweetheart, she is so good for being so young. Do they make Baby Bjorns in kitty size? I don't know, but that's a great idea! I can just imagine how cute Wylla would be with all four legs sticking straight out from a Baby Bjorn... And it might be soothing for her, kind of like being wrapped up in a blanket. 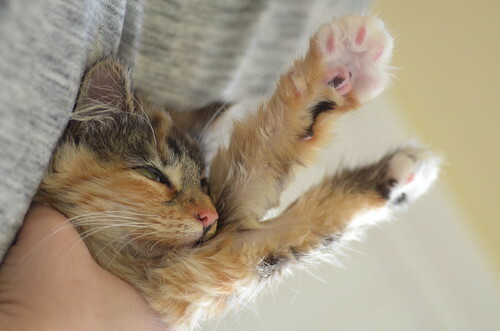 I have to stretch her out when I hold her. I think sitting in such a device might keep her too compressed. Every day I think Wylla has reached the peak of Ultimate Cuteness, and every day she climbs to yet new heights. How do you get anything done with this little furball (plus, of course, her big sister) to love on??? Now I can see why you formed such a strong bond with little Wylla, holding her near you after each feeding :)...these pics show real TLC (as well as major cuteness). And many thanks to Craig for capturing this charming moment. That's right Wylla: put your paws in the air and wave 'em like you just don't care. It's amazing how cats can sleep in just about any position. Almost like changing from solid to liquid. Good God!! Wylla's overall cuteness quotient is almost unbearable! I can't even... GUH. Speechless. Cuteness. Paw pad stretch! Floofy ever-so-slightly arced legs! That face! Belly fur! Her coloring! Her sweet gentle spirit that just allows & accepts this TLC. She is SUCH a special kitty. I so admire what a dedicated family effort you all -- Laurie, Bean and Craig -- take on, caring for Wee Wylla. Too bad we don't all live on your street. We could buy tickets to hold Wylla after her meals! Full belly and being held close by Mom - definitely nap time. I mean really, aside from Bean, MOST ADORABLE KITTEN ever! 4) pink kleenex for sopping up tears from reactions to overwhelming adorableness. Now that is one relaxed cat i don't even think i could fall asleep being held liked that! It's post-surgery. You just can't see the shaved section in the photos. "Mooom, if I hold my arms in the air, will it make the food go down faster??" Wow she really is tiny. With your hand on her, it's easy to see how much of her is floof. There is just no end to the cuteness that is Wylla! I wonder if Wylla ever wishes she could eat at the Big Girl table with Bean. What a sweet life story you are sharing with everyone. Thanks. Aw, that's too cute! What a little doll! Will carrying her around like that still work when she grows up? I suppose if she stay small it might. Mega-E cats tend to be pretty small - only five or 6 pounds full grown. She's pretty used to the routine so hopefully it won't be an issue. So adorable! And thanks to you and Craig and Charlene for being there to take care of her! Raise the roof, little peanut! Wylla looks like she would be right at home at hip-hop show. I immediately thought the same as Sam. "Wave your paws in the air..."